Millions of Americans fight depression, anxiety, and panic disorders. The world’s pharmaceutical companies have responded, developing a bevy of antidepressants, anti-anxiety medications, and other drugs to combat these disorders. But the drugs are not without risk, and many healthcare professionals, doctors, and patients have voiced concern over serious complications from antidepressants. Prozac (fluoxetine) is one of the most popular antidepressant medications available in the United States. The SSRI (selective serotonin reuptake inhibitor) is manufactured and sold by Eli Lilly, and has been available since 1987. The FDA originally approved the drug to treat adult depression, but Prozac has since been given the green light as a treatment for other disorders. As with other antidepressants, Prozac side effects can be severe, extending to sexual dysfunction and suicide ideation. Additional links between Prozac and pregnancy show that the SSRI medication can cause potentially fatal birth defects, including PPHN (persistent pulmonary hypertension of the newborn) and heart defects. Furthermore, Prozac has been shown to induce euphoria – a complication unique to fluoxetine – which increases patient dependency and addiction to the medication. Eli Lilly chemists Klaus Schmiegel and Bryan Molloy first discovered fluoxetine, and when the drug received FDA approval in 1987, it became the world’s first selective serotonin reuptake inhibitor (SSRI). 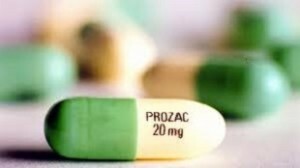 Prozac was first approved as an antidepressant, but was later approved to treat additional disorders, including obsessive-compulsive disorder (OCD), panic and anxiety disorders, and pediatric (child) depression. In 2001, Prozac’s patent expired, allowing it to be sold off-brand. The generic name for Prozac is fluoxetine. As of 2013, both brand-name Prozac and fluoxetine are still widely prescribed within the United States, primarily to treat depression, panic disorders, and anxiety. In 2010, 24.4 million prescriptions were written in the United States for generic fluoxetine, exposing millions to the potential risks of Prozac side effects. As a selective serotonin reuptake inhibitor (SSRI), Prozac does just that: inhibits the reuptake of serotonin. In plain English, this means that Prozac blocks the brain’s absorption of serotonin, a chemical that experts believe regulates depression. By inhibiting or blocking the elimination of this important chemical, Prozac allows the brain to maintain higher levels of serotonin, and thus eliminate or reduce feelings of depression. Unfortunately, the benefits of Prozac do not come without some risk. Minor side effects and withdrawal symptoms, including dry mouth, nausea, agitation, increased perspiration, weight gain, insomnia, headache, and diarrhea. Over time, high dosages of SSRI medications can increase the severity of complications, including Prozac side effects. One of the more dangerous risks is that of Serotonin Syndrome. Essentially, Serotonin Syndrome is an overdose of serotonin in the brain. The condition can be rapid-onset, happening in just minutes, and can result in hyperthermia, high blood pressure, tachycardia (increased heart rate), and shock. Serotonin Syndrome can be fatal. Few medications have been approved to treat pediatric depression (depression in children), but Prozac is one of them. Unfortunately, Prozac has also been linked to increased risk of suicidal thoughts in children and young adults. In 2004, the FDA released a public warning regarding the link between fluoxetine and pediatric suicide risk; in 2006, the FDA updated the warning to include Prozac users up to 24 years old. In 2007, the FDA required Eli Lilly to add a black-box warning – the most serious of all drug warnings – to inform patients of an increased risk of suicidal thoughts during their first two months taking Prozac or generic fluoxetine. Pregnant women on Prozac have a serious decision to make: Continue taking their antidepressant meds and risk birth defects, or cease treatment and struggle with depression, anxiety and other serious disorders. This unfortunate decision is due to the risk of a fetus sustaining Prozac birth defects. Nevertheless, the advisory agency has labeled most SSRI antidepressants, including Prozac, as “C” grade for use during pregnancy. This means that SSRI drugs are known to harm animals when given in large dosages, but the effects on human fetuses has yet to be solidly established. Why do patients file Prozac lawsuits? Individuals and families who have suffered the fallout from Prozac side effects file lawsuits for several reasons. The primary goal is to secure economic compensation for their injuries, to cover lifestyle adjustments, medical bills, lost wages, and similar damages. A Prozac lawsuit can also cover damages for loss of consortium, or loss of companionship, when a spouse, child or other loved one commits suicide after taking Prozac.